When Professor Vijay Govindarajan accepted a two-year professor-in-residence position with General Electric in October 2007, he met with chairman and CEO Jeffrey Immelt D'78 to find out exactly what he would be doing. 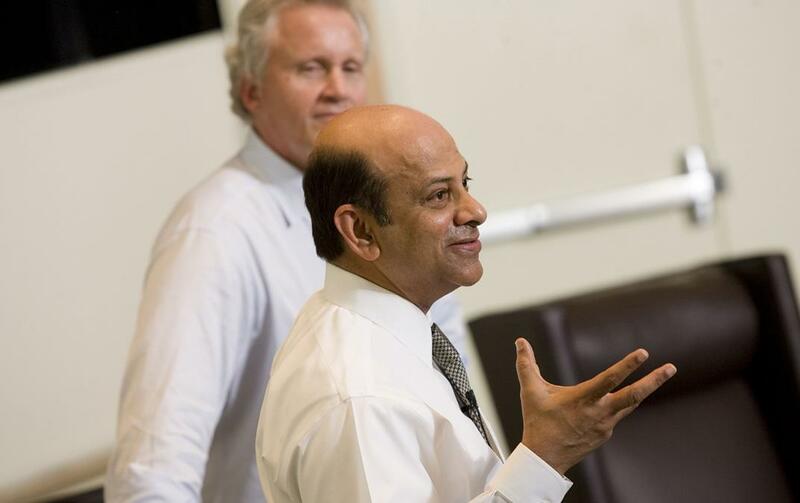 When Professor Vijay Govindarajan accepted a two-year professor-in-residence position with General Electric in October 2007, he met with chairman and CEO Jeffrey Immelt D'78 to find out exactly what he would be doing. What he heard made him extremely uncomfortable. "He said, 'Let's use a Darwinian approach. Let's not give you a project. Let the project evolve.'" As the newcomer to a company he'd admired since he had been a student, Govindarajan was nervous. With no structure or assignment, would anyone even talk to him? Looking back on it today, Govindarajan sees the wisdom in Immelt's response. For the first six months, he met in small groups with the top 600 officers at GE. "What he was trying to accomplish was for me to get to know GE, and for GE to get to know me. If he had told me to start a project on January 1, I would have struggled to find my way. I might not have gotten the acceptance of these people. After the first six months, Immelt asked Govindarajan to focus on GE Healthcare, India. Over the next year, Govindarajan visited India four times and spoke with executives there by phone on a weekly basis. "My job was not to manage anything in GE. My job was as an outsider, facilitating the progress of innovation." He created a steering committee of key decisionmakers at GE Healthcare, and a task force in India of representatives from engineering, marketing, servicing, and manufacturing, whose ideas and progress he would share with the steering committee. He was a linchpin between the people on the ground and those in the upper levels of the organization. The Indian task force also came up with a unique financing scheme in which an entrepreneur can borrow $400 interest-free from the State Bank of India to buy a scanning machine. Every day, the bank collects 27 rupees, which means the owner only has to complete three scans a day to pay back the loan. "So they not only innovated the product," noted Govindarajan, "but set up the financing in a creative way that opened up the market. The biggest impact he had on GE, he now reflects, is the way in which the company embraced his so-called three-box framework for organizing business strategy, which it now includes in its strategic plan. Also during his tenure, the company appointed a CEO for GE Healthcare, India, who reports directly to the CEO of GE Healthcare. "This is a huge shift because India is being heard at the highest levels, and this will result in more resources, more attention being given to India. Based on his experiences with GE in India, Govindarajan helped define a business process that he calls reverse innovation. He, along with Immelt and Tuck adjunct associate professor Christopher Trimble T'96, introduced the concept in an article they co-authored for the Harvard Business Review in 2009. In it, they describe how companies are now developing products specifically for markets in India and China and then marketing those products in North America and Europe. Govindarajan also created a "reverse-innovation toolkit" that will be useful to all GE businesses and has a book in the works on that topic. He says he has enough questions to fuel his research for the next 25 years. "They are tackling far more interesting issues than I fully grasped. So we have a lot to learn."